Venthaya Dosai is my husband's all time favourite and I prepare it often. My MIL gave me this recipe. She used to prepare onion chutney as well sambar. Between these two, I prefer sambar.I normally make sambar for dosai bit different from usual procedure. Go here for Sambar recipe. Fenugreek is good for health and is known to have anti-diabetic property.The interesting information is it helps in reducing weight. 1. 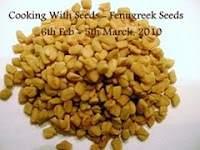 Soak rice,dhal & fenugreek seeds together in water for 4 hours. 3. Add needed salt and then mix well. 4. Allow it to ferment for atleast 8 hours. 5. 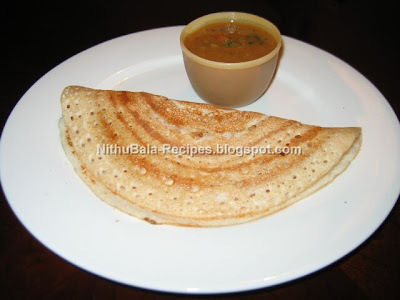 Make dosas and serve with chutney/sambar. ummmm nice dosa....feel hungry......collect the award dear..
Wow dosai looks great with sambar, this is my fav too. Dosa looks crispy and yumm!! vendhaya dosai looks perfect with the sambhar!!!! Love the smell of Methya dosa, looks good. I love all types of Dosha's ..I had dosha today also. dosa looks so gud!! thanks for sharing info abt these seeds too..so healthy!! nice yummy dosa with sambar. Dosa looks very crisp and great Nithu!!! Dosa looks nice crispy. Perfect with chutney/sambar. Wow so much of methi ,will dosa be a little bitter.